This what your Scatter/Brain Blog Ad will look like to visitors! Of course you will want to use keywords and ad targeting to get the most out of your ad campaign! So purchase an ad space today before there all gone! Plain and simple with no alternative. You endure hard work to understands what it means to work hard, so you may truly value the fruits of your labor. Graduating from a one of the best high schools and a pretty good College in Massachusetts to entering the full-time workforce as well as Graduate school (a pretty good one too) is the result and continuation of hard work. I am hard-working at heart but lazy by habit and those two things don’t always live peacefully. From Freshman year of high school, I’ve had a job, some easier than others but none were a waste of time. I’ve grown with each, whether it was from success or from failure, I’ve grown. Now that is not to say I’m a freight train barreling down the tracks…I’m more a Thomas the Engine telling myself, ‘I think I can I think I can’. I work hard, I falter, I push things till the last minute, and then I work even harder to get them done. Rinse and repeat. Most times I come out successful, most times… Who is to say how much more I could have accomplished, or who I could be further down the tracks? Who knows, who cares. A while back I decided to just work harder than my bad habit, and that hard work has slowly become a habit. The Fruits of my labor? Promotion in half the standard time, reputation for quality and excellence so my mistakes are most times chances, sometimes coincidences, but never trends. Finished? Not even close, Work requires more of me, School requires more of me, and I require more of me. Discovery is the breath of life and fearing it is the hand of death, holding you back from living, only to exist and nothing more. I have a love/hate relationship with the “shore”, it’s safe, and at time, it is what is needed when the noise of life is too much. Complacency however, can grip you and so I am often on the move, embracing discovery in its many forms; people, places, things (many things, I love things). I am a Jamaican-born, Boston-bred, Scatter/Brained man on the move. My interest varies and sometimes conflict but a staple in my life has always been my thirst for adventure, the outdoors, nature, and the tranquil uncertainty in the freedom it offers (I do love the city but it is a shore to me). I have traveled to a few places (mountain, trails, etc) throughout New England simply to disappear from society and discover myself, to breathe. It has been the sole constant way for me to take a deep breath. Until discovery found me, and it was truly was an ocean of sorts, with a smile like a wave crashing at night. I became her new discovery and she became mine. Which made the shore irrelevant because wherever we were, the ocean followed. She is my Sunlit Moonlight that I am slowly discovering more of her every day. I myself love quotes. Not because they motivate me or because they make me think differently (they do). I love quotes because they are like short stories that you decide how they begin, end, and what lessons are learned. They could mean/help with vastly different things/scenarios and each one is valid for every person (until they say it out loud and spark a pseudo-philosophical debate). Every time I come across a quote I like, I always wonder why it existed in the first place; what was the person going through that spurred them to say or write it and out of all the things they have said, why is this something they are remembered for. For example, if the quote resonated with me, I think, “could that mean that the person and I have gone through similar difficulties in life, or is history really a wheel that keeps coming back around?” Or simply I connected with a different meaning/reasoning than the originator. I look at the quote and I reasoned that it is chastising me and telling me that everything I repeatedly do’ that holds no positive value in my life are bad habits. That bouts of excellence in my life are not substantial because they are inconsistent. A habit doesn’t take breaks, and if excellence is a habit I aspire to, then bouts won’t cut it. PS – This is my first blog post ever and as a private person, doing something like this is a great departure from the norm. However, excellence doesn’t bend to change, nor does it brace for it. Excellence welcomes it with an open door and open eyes. 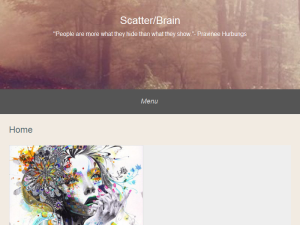 If you are the owner of Scatter/Brain, or someone who enjoys this blog why not upgrade it to a Featured Listing or Permanent Listing?